Fins are used in a large number of applications to increase the heat transfer from surfaces. Typically, the fin material has a high thermal conductivity. The fin is exposed to a flowing fluid, which cools or heats it, with the high thermal conductivity allowing increased heat being conducted from the wall through the fin. The design of cooling fins is encountered in many situations and we thus examine heat transfer in a fin as a way of defining some criteria for design. A model configuration is shown in Figure 18.3. The fin is of length . The other parameters of the problem are indicated. The fluid has velocity and temperature . We assume (using the Reynolds analogy or other approach) that the heat transfer coefficient for the fin is known and has the value . The end of the fin can have a different heat transfer coefficient, which we can call . The approach taken will be quasi-one-dimensional, in that the temperature in the fin will be assumed to be a function of only. This may seem a drastic simplification, and it needs some explanation. With a fin cross-section equal to and a perimeter , the characteristic dimension in the transverse direction is (For a circular fin, for example, ). The regime of interest will be taken to be that for which the Biot number is much less than unity, , which is a realistic approximation in practice. where is an internal temperature. These two quantities must be of the same magnitude. If , then . 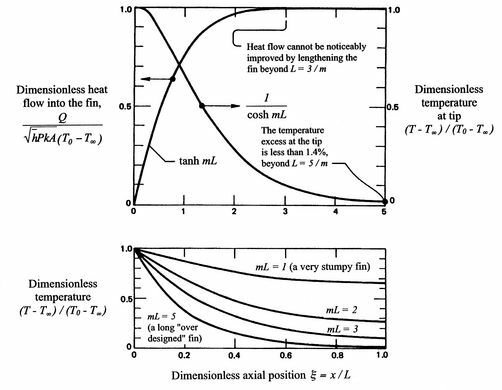 In other words, if , there is a much larger capability for heat transfer per unit area across the fin than there is between the fin and the fluid, and thus little variation in temperature inside the fin in the transverse direction. To emphasize the point, consider the limiting case of zero heat transfer to the fluid, i.e., an insulated fin. 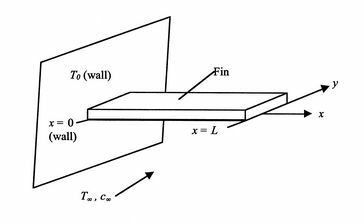 Under these conditions, the temperature within the fin would be uniform and equal to the wall temperature. If there is little variation in temperature across the fin, an appropriate model is to say that the temperature within the fin is a function of only, , and use a quasi-one-dimensional approach. To do this, consider an element, , of the fin as shown in Figure 18.4. There is heat flow of magnitude at the left-hand side and heat flow out of magnitude at the right hand side. There is also heat transfer around the perimeter on the top, bottom, and sides of the fin. From a quasi-one-dimensional point of view, this is a situation similar to that with internal heat sources, but here, for a cooling fin, in each elemental slice of thickness there is essentially a heat sink of magnitude , where is the area for heat transfer to the fluid. The solution is plotted in Figure 18.5, which is taken from the book by Lienhard. Several features of the solution should be noted. First, one does not need fins which have a length such that is much greater than 3. Second, the assumption about no heat transfer at the end begins to be inappropriate as gets smaller than 3, so for very short fins the simple expression above would not be a good estimate. We will see below how large the error is.